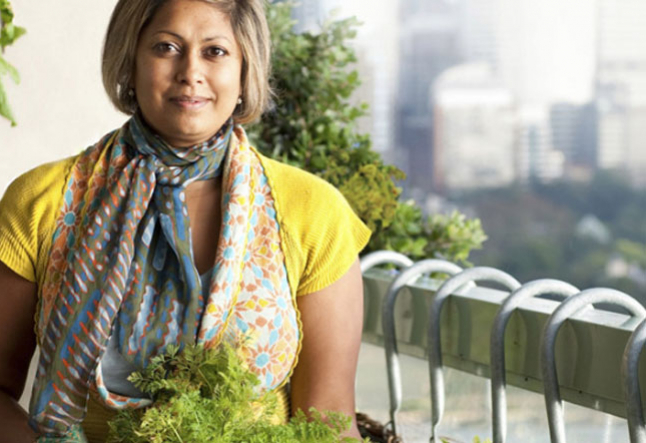 When Indira Naidoo transformed her tiny thirteenth-floor balcony into a bountiful kitchen garden, it changed her life forever. She joined the quiet revolution rolling through our cities - the army of urban gardeners turning concrete into crops, and harvest into hope. She also came to realise that gardening spaces in cities are limited only by imagination. Sophie Ansel for YOGI TIMES: Are community garden growing in cities in Australia? Indira Naidoo: It is really taking off in the last 3-4 years. In Australia now there are 700 community garden across the country. It is growing on in the world as well. I spend quite a bit of time in America - San Francisco, New York, in Asia in Hong Kong, and in Europe, Berlin, Spain. All the big cities had a big movement to encourage people to grow some of their own foods. The reason is different depending on different communities. Some communities are just concerned about what is in their food. They want to grow things that have no chemical and are organic. Some communities are very poor and can't afford to buy foods. They want to grow their own so that they can help their family budget. Other communities are saying they're have been park and trees in their cities and they want to see green back. Most communities actually realize that they become very socially disconnected from each other and people look very lonely like. Community garden are great way to make friends and spend time with other people in your neighborhood or in your apartment. SA: What is the position of Australia regarding City Community Gardening? Indira Naidoo: Australia is not leading it at all. We had political issues in Australia in the last 10 years. We had governments that have not supported green trends and climate change initiative - helping people being sustainable. Australia has been really behind a lot of other cities country! SA: What are the benefits of those communities? Indira Naidoo: The main benefits is that too much of the food that we have in the cities come from very far away which means it has cost lots of money to transport to refrigerate to store and the time it takes through all that food can move and flown all over the world. There is lots of nutrients that get lots. By the time you have that bunch of spinach, it lost third of its nutrients already. So its not going to be as good and you are not going tot feel as good. The closer you can grow your food to where you are living its going the best its giong to be not only for the environment but also your health and also the quality in the food. SA: Are restaurants supportive of those initiatives? Indira Naidoo: There are lots of restaurants that are sourcing their own produce for their establishment. In my book "the edible city" I talk about a restaurant in Sydney called "Billy Kwong" in Potts Point. It is sourcing vegetables just often from the suburbs around. I work at the Wayside Chapel and I tell the story in the book. We have put 200 m2 garden of vegetables on the roof of the wayside chapel. It is run by all the homeless visitor. The chapel help people who are poor and who have drug problem and are homeless. We have 4 beehive and we make honey used in the billy kwong on the menu. There is another refugee garden also in elizabeth point. they grow coriander and vietnamese mint for the restaurant. It is lovely to see chef like kelley kwong supporting and encouraging community around her to growing their own food and paying the money so they can support the garden. SA: how did you get inspired in the first place? Indira Naidoo: My background is TV news presentor and a journalist. I was looking at all the things that were causing the conflicts in the news stories I was presenting. Tribal conflicts or disputes over mine. It was still connected to shortage of food and water. So when I look at that more I realized that is going to be the biggest problem we will face in our future. Where will our food come from and where will the water come from? If we did not source that out we will have more conflict and more wars. when i spent more time doing it I worked with United nations, I worked with Al gore, US vice president in his climate change movement. Then i started realizing : We, in the city, have to connect more with our food. I just live an appartment with 20M2 balcony on 13th floor. I thought, I am the sort of person who shall start grow my own food so we can start adressing this issues on our food and where it comes from. In one year I grew 70 kilos of fruit and vegetables on my balcony! I had never been a gardener. I grew 43 different herbs. I grew Lemon potato tomoatoes, even strawberries... Everything tasted better it was all organic. And that is how I wrote my first book the "Edible Balcony" which show lot of people that just because we are not gardener and don't come from background where people grew food, we can still grow things in the space you got around you. Then I explored how other people grow their food in the country, and this gave birth of my second book which is about their stories digging up the food path, putting a garden in a school , next to a retirement village, on a rooftop etc...! Both books have lots of recipes using the produce I grew and I still grow and saw grown in those garden. SA: What are the main challenges to grow food in the city? Indira Naidoo: There are numbers of challenges. One of them is the councils. Some of them are supportive and allow people to take some lands over to grow garden, other council think it's going to be messy or dangerous people will fall and sew the council and so they try to stop it. I would like to see council and government more supportive and fund people to grow their own food. In Paris, they declared that every building in paris has to have a green roof. I would like to see that in Australia! I think it's more the bureaucracy that is the biggest problem. The second thing is trying to grow something on the roof: there are problems with wind, possum, birds. there shall be some support to face those challenges.